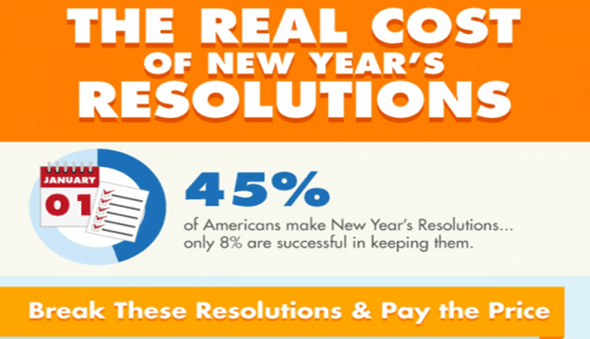 What is Your New Year’s Resolution Costing You? I know this infographic was done by Bed, Bath and Beyond, but when I saw it over on Visual.y I knew that I wanted to run it. I wrote at the beginning of 2013 that I do not believe in New Year’s Resolutions. I am not really against them because I want to be anti-improvement or anti-change. To the contrary, I think both of those are good and needed – as appropriate. Those are all good things to strive for and I know that I need to work on a few of them myself, but they largely fail because there is nothing measurable, nothing expected of us in them. Sure, spending more time with the family can happen but what will you put in place to make yourself accountable to that and make sure it is something you can measure? That is what I like about this infographic. Not only does it give actionable tips of things you can do and possible costs associated with them, but it also suggests you take a small number of things you want to improve in and focus on those. I’m not going to bore you with another rundown of the SMART goal system as that has already been done, if not overdone, by myself and others. However, the point remains that if you want to see success in your goal, resolution, or challenge you need to make it measurable and something you’re going to hold yourself accountable to. This is also not to mention the fact of the related cost that comes with why we need to change such things. If the need to change isn’t strong enough, then the cost should certainly be a motivator. So, after taking a look at this infographic I see again that I simply need to become more organized in my life. I don’t know where they got their numbers, but I know disorganization is costing me money…not to mention time! What are your thoughts on New Year’s Resolutions? What changes do you want to make and what will it cost you if you don’t? What stood out to you on the infographic? It’s amazing to me that “Stress” costs the economy $300 Billion! Smoking and exercise are obvious, but I would have never guessed that stress related items affect us to such a large degree. I know, that was crazy to me as well. But, I think it’s right on though as stress can impact so many things when you’re looking at health issues. I love this infographic’s suggestions for family game night or library dates as an alternative to dining out and movies. Cheaper and still lots of fun. I really liked that as well Dee. It just goes to show you that you don’t need to spend a ton of money to have fun. Yikes scary to see how much stress can cost you! I would say that’s the one thing I’m most guilty of and deal with the worst. It’s nice to see that doing things like getting organized can actually pay off in a financial sense. I know, it is crazy DC. We’ve seen it in our family and it’s not good. I agree, it is nice to see how being organized can pay off for you in terms of finances. Definitely some interesting numbers there. I think it can definitely help to put some dollar signs around the things we’d like to improve, but I think it’s even more helpful to think about one small step we can take every day to actually make it happen. I definitely struggle with disorganization as well, and it can definitely be stressful. Great point Matt! I think that is a great way to go about change – taking small actionable steps that can build up over time. I think that makes it more “manageable” and simpler to work on. Biking to work is a great idea to both save money and get exercise. I’ve been doing it for four years now and wouldn’t dream of going back. The trick is to commit at least 4-8 weeks to get into the new routine. I agree! We have friends that do that and it does save them a good chunk of money and is awesome exercise. I could not agree more Liz! I’ve improved somewhat in terms of organization, but know that I have quite a ways to go on it. Disorganization causes me a great deal of stress. I like things to be in order and planned out, as much as can be expected. I hear you on that Brian. It can definitely be stressful, which is why I want/need to improve in that myself. I like how this shows what NOT following through can cost you. Clearly it’s expensive! Exactly! Very much why you need to keep it simple and quantifiable. Dang, Bed Bath and Beyond – droppin’ the new year’s resolution knowledge on us! Great infographic, and thanks for sharing. It’s interesting to see some of the more popular goals broken down this way! And I agree with what you mentioned at the beginning of the post – goals need to be actionable AND measurable. Lol, I know, who woulda thunk it? 😉 Yes, both of those are very important! I am one of the 8%!!! Whoo hoo! I don’t usually make resolutions but I did last year and that was to not get a parking ticket all year. Ask your wife how tough that can be in the greater LA metro area. Street sweeping is a mofo that a lot of people get tickets for. But I was super diligent about moving my car and I’m stoked not to have given a dime to the various cities which make a killing from it. BTW, I would think it would be more than 800 for the lose weight thing being that so many people ignore their gym memberships! But great infographic! Awesome Tonya! Yes, I’ve heard my wife share many stories about those infamous tickets that she got a few of herself. Good for you for not getting any! It’s no surprise to me that Stress costs that much money. In fact, it is one of the reasons I believe the gap of life expectancies of men and women to be closing – more and more women are in the workforce and there is a heavy toll to pay for that in terms of stress/job satisfaction [and I’m not saying the alternatives weren’t stressful, it’s just different]. JMO. That’s awesome Elroy! We have friends that do something very similar and you can’t beat getting to exercise virtually for free! I don’t really like the idea of New Years Resolutions (oh well). It’s not like all of a sudden, January 1st hits and your slate is wiped clean. Personally, I think every day is a great chance to start working on something to better ourselves. I see too many people at the gym in January – those newcomers “pledged” to lose weight. Funny how most of them don’t stick around by February . Completely agreed Troy. I understand that people want to improve/grow in something but it really doesn’t make sense to wait around if you see the need to change. You’re just losing out on time, among other things, in the long run. I think when all is said and done.. Meeting those new years resolutions (stopping smoking, getting better health) will end up saving you more money in the long run! Very true Jefferson! That’s much of the reason why a long term view is so important! I think everyone who has a New Year’s resolution should see this one, so that they would really do what they plan and try their very best to achieve their goals. Great infographic, John! I’m not a huge fan of New Years Resolutions, even though I love setting goals. For me, New Year Resolutions are easily broken and virtually everyone expects people to break their New Year Resolutions. So it just seems like a set-up for failure. 🙂 Even though the goals are very worthy and obviously have a huge payoff as your info graphic illustrates. It did shock me a bit to see only 8% actually keep their New Year Resolutions. I expected the percentage to be low but not single digit low! Happy New Year! Thanks Shannon! I’m the same way. I’d much rather set goals and make them quantifiable as opposed to some random resolution I know that I just won’t reach. Happy New Year to you as well! This is a FANTASTIC infographic! I love the fact that it highlights Quality Family Time as a great way to save money. We recently had family in for the holidays and had hours of fun playing Heads Up which is a free app on our i-Pad. Definitely agreed Travis and I’m on that same wavelength as you are. It’s amazing the true cost of inaction. Great info John especially the dieting part. My health and weight will be my 2014 focus. Love it! I believe in the quantifiable goal too, which is why I tied my resolutions to specific goals by the end of the year. Ambitious goals, but hopefully we’ll get there! Riding my bike has certainly helped me keep resolutions from the past! There are so many free or cheap resources out there to help manage weight, but everyone goes to the paid ones first! It’s so funny how disorganization truly is bad for us! That’s my goal for this year and I realize one of the ways I can organize is by getting rid of stuff. Right now I’m in Spacebag territory: too much stuff and not enough space. It’s driving me bananas! I know the feeling Tara! My wife and I were just discussing that very thing last night and how it gets worse when you have kids – we simply have too much stuff! I hate to say it but I would be surprised if 8% of people were able to keep their resolutions. I am seeing the “attempt” now with the increased activity in my gym. I noticed this last year and it lasts for maybe two weeks. My personal resolution is simply eating out less. Both from a frugal and health perspective, I should do a little better this year.